The contents of this website, including trademarks, logos, images, data, product and company names, drawings, etc. are protected by intellectual property rights and belong to Air Promotions Agencies or entitled third parties. Air Promotions Agencies makes every effort to ensure the information provided is complete, correct, accurate and updated. Despite these efforts, errors may occur in the information provided. If the information on the site contains errors or if certain information on or via the site would be unavailable, Air Promotions Agencies will do its utmost to correct this as soon as possible. Air Promotions Agencies cannot be held liable for any direct or indirect damage arising from the use of the information on this site. The contents of the site can be adjusted, modified or supplemented at any time without notice or notification. Air Promotions Agencies does not guarantee the proper functioning of the website and can in no way be held liable for malfunctions or temporary (un)availability of the website or for any damages, direct or indirect, which would result from the access to or use of the website. Air Promotions Agencies can in no case be liable against anyone, direct or indirect, special or otherwise for damages due to the use of this site or another, especially as a result of links or hyperlinks, including, without limitation, all losses, work stoppages, damage to programs or other data on the computer system, software or other of the user. Air Promotions Agencies expressly declares that it has no control over the content or other features of these websites and cannot be held liable for the content or features or any other form of damage caused by its use. The Belgian law is applicable to this site. In the event of a dispute only the courts of the district of Brussels have jurisdiction. Air Promotions Agencies values your privacy. Although most information on this site is accessible without providing any personal information, it is possible that the user's personal information is requested. This information will only be used as part of our customer management, to keep you informed of our activities or answer to your questions. The user can, free of charge and by request, oppose to the use of personal information for direct marketing. 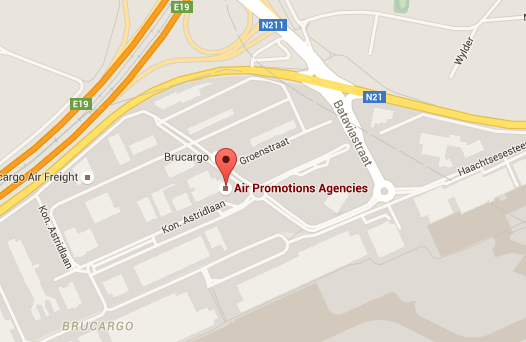 The user will send his request to Air Promotions Agencies, Building 740 – 1st floor, 1931 Brucargo – Zaventem, Belgium, info@apa-air.be. Your personal information is never shared with or provided to third parties. In accordance with the law processing personal data of 08/12/1992, the user has a legal right of access to or correction of his/her personal information. Providing proof of identity (copy of identity card) by sending a written, dated and signed request to Air Promotions Agencies, Building 740 – 1st floor, 1931 Brucargo – Zaventem, Belgium, info@apa-air.be, you will receive a free written notice of your personal information. If necessary, you can also request to correct inaccurate, incomplete or irrelevant details. Air Promotions Agencies may collect anonymous or aggregated information of non-personal nature, such as browser type or IP address, operating system you use or the domain name of the website through which you have come to our website, or through which you leave. This enables us to continuously optimize our site for users.